Colleen Hoover is one of best authors I’ve ever read and her books are always sitting at the top of my recommendations lists for every kind of reader! Her books are absorbing, her characters are endearing, and each new story she writes is unique, relatable, and thought provoking. She has a very distinctive writing style that I absolutely love, I also respect and admire her as a person — the charity she has started is incredible, and each time she announces a new book, I count down the days until I’m able to read it. Without Merit is unlike anything she’s written before. She returned to her YA roots with this one — more in the vein of Slammed and Hopeless — and yet this story is still very different even than those. It’s a slow building, slow burning story that eventually takes you completely by surprise. The most important thing to keep in mind when reading this book is that perspective changes everything. The story doesn’t tell, it shows you. It’s real, raw, and painful. And yet also deeply heart-warming and healing. It conveys a powerful message that tackles tough subjects with grace. It’s relevant and relatable. It’s a book I’d want to give to every teen, but at the same time I believe everyone would enjoy it. The story takes you right into the dark, but also brings you back and leaves you smiling. Other than the blurb, I don’t really want to post too much about what the story is about. Colleen Hoover is one of the authors who has fully gained my trust over the years and for me just knowing that she wrote the book is enough to make me feel confident diving into the story blind. I would strongly encourage you to do the same. 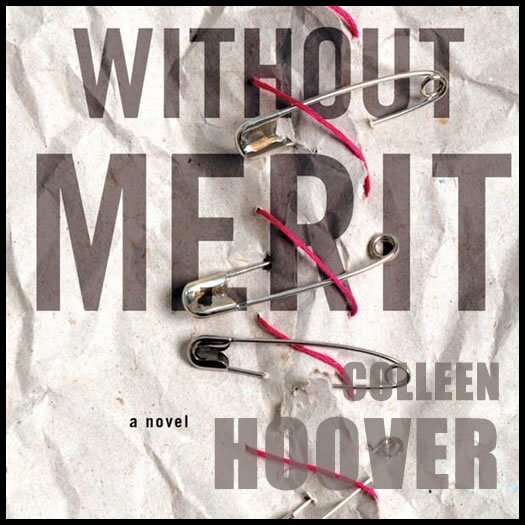 Without Merit is a quietly powerful read. It’s a slow build that didn’t really keep my heart racing as I read, but I believe that was intentional. I don’t think it was meant to be an angsty style of read. I think it was meant to be more of a fictionalized reflection of something closer to real life. Sometimes the things that influence a person’s choices the most come quietly. This isn’t the type of story where one huge, cataclysmic event changes everything. It’s the opposite. It’s a butterfly effect times ten. It’s the result of many smaller events that all together build a storm. The first chapter really sets the tone for the whole book. You’re introduced to Merit’s character — her hopes and frustrations, and then there’s this one moment where you suddenly realize that nothing is as it seems. Everything about her life was unusual, odd, different than normal — like the Adams family of small town America — and as the story goes on you could really see how much she suffered from a loss of identity. When you think about ‘child neglect’, your mind often jumps to extreme – abusive – cases. But it can manifest in so many ways. Sometimes a simple lack of attention can be enough to make a child feel so invisible that they lose their sense of self-worth. This story has many layers to it and they build. Like I said, it’s the butterfly effect many times over. The writing is brilliant. And it builds so quietly that you don’t even notice that a storm is brewing until the moment where everything just explodes. Implodes. Everything is turned on its end and as the reader you’re RIGHT THERE with it. The story shows you every detail. It doesn’t tell you what to think. It makes you draw your own conclusions. Without meaning to, you can’t even help but judge situations. But then it shows you this one missing piece that makes you realize how wrong you were. It’s very cleverly written and eye opening. As I said, this book is unlike anything else Colleen Hoover has written. It’s a new direction for her and, like all her other books, it’s a strong and stellar read I whole-heartedly recommend. If I had to describe it, I’d say it’s very much like It Ends With Us in feeling, but instead this book is targeted at the teen age range rather than adult. But again, I do believe this is a book that everyone will enjoy! It’s easily one of my favorite books of the year! Pre-ordered the moment I saw it! Soooooo excited for this one! My most highly anticipated 2017 read!! Super, super excited to read this one! Loved your review! I just love her books. I have never gone through so many emotions in a few hours. There are so many things to learn and understand from each and everyone of the characters. P.S. I was squeeling when the bookstore scene came. I have read many great books based on your reviews!! They are always so well written and informative!! Thank you!! I love all Colleen Hoover books!! Can’t wait to start this one!! I literally learnt so much from it. Seats, you’re my go to girl for finding the perfect read. Your reviews of the books you love are as good as the loved books themselves and has enabled me to be lost and found in amazing stories such as this latest CoHo book. I’m eagerly awaiting her next due out soon. Thanks Aesta for what you do so well.